Reiman Foundation and the John Lynch Foundation recognize local student-athletes. On Friday, May 12, The John Lynch Foundation held its 19th Annual Salute the Stars awards luncheon at Sports Authority Field. Sponsored by the Reiman Foundation in partnership with Big Brothers Big Sisters of Colorado, the event recognizes student-athletes, including those with special needs, from around the state who shine in academics, athletics and community involvement. 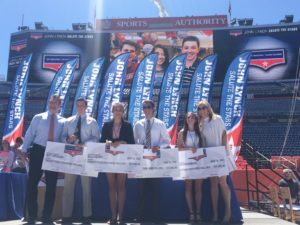 This year, the event awarded over $118,000 in scholarships and hosted more than 1,000 students from Denver public schools and surrounding school districts. Since it began, the John Lynch Foundation has awarded $1.1 million in scholarships to over 169 student-athletes to honor their hard work as well as provide financial support towards college tuition and other post-secondary programs. 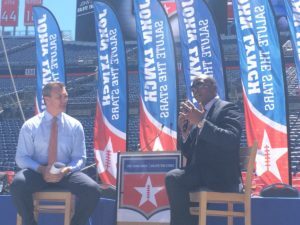 New Broncos Head Coach Vance Joseph speaks to students at the Salute the Stars event on May 12, 2017. For Reiman Foundation Chairman and CEO Scott Reiman, Supporting Salute the Stars brings him happiness. Through their work with various educational institutions and community organizations, Reiman and the Foundation are committed to helping provide children from all backgrounds every opportunity to succeed and thrive. Reiman invests a significant amount of his time in civic and business organizations throughout Denver, including the Denver Art Museum, ACE Scholarships, Graland Country Day School, Rocky Mountain Public Broadcasting Network and the Quarterly Forum. He is also a founding member and active supporter of the Denver Scholarship Foundation.